Looking for a Medical Assistant program in Northern California? Unitek College is a private, accredited institution with seven locations in the state of California. 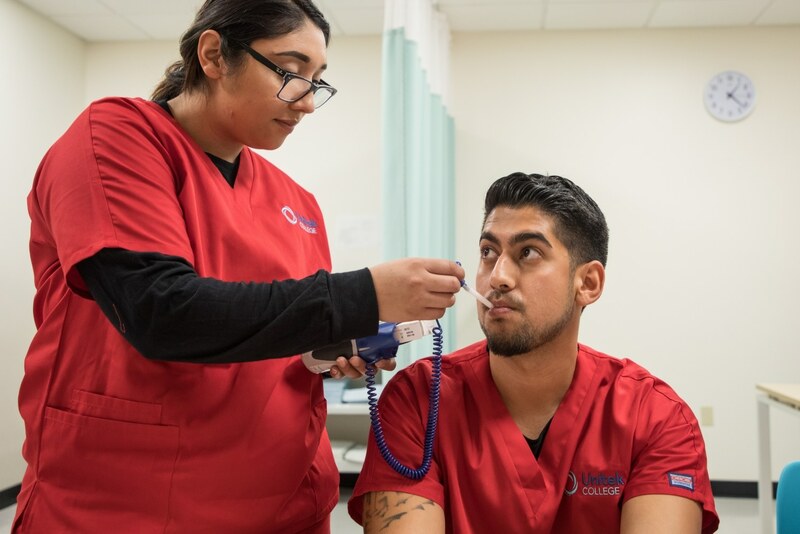 Today, we’re going to give you a brief overview of our Medical Assistant courses at the Fremont Campus. Located near the I-880 highway, the Fremont Campus is framed by mountainous views and sunny skies. The city of Fremont has been a Tree City USA since 1996.1 A city that understands the importance of urban forestry, Fremont maintains approximately 55,000 trees in city parks, streets, and landscaped areas. Additionally, Fremont has numerous parks, historic farms, wildlife refuges, regional preserves, and several other recreational areas. One such area is the Niles Essanay Silent Film Museum, which shows silent films on a weekly basis. While it’s vital for students to work hard, we believe it’s equally vital for them to take breaks and recharge. At Unitek College, we are proud of our dynamic, well-rounded curriculums. Several Unitek programs give students access to healthcare facilities, active training, and expert instruction. Many of these programs can be completed in a year or less. Additionally, some Fremont students can choose to take morning classes, midday classes, or evening classes. If you’re searching for a speedy program, you can receive Medical Assistant training in as little as 9 months. At Unitek, we provide a program that enables students to take charge of their future without spending years in school. Our educational approach features a combination of professional lectures, hands-on exercises, and a 160-hour supervised externship. While students utilize fully stocked lab rooms, the MA program also focuses on critical tenets like teamwork and communication. When selecting a Medical Assistant school, it’s important to pick one with a comprehensive curriculum. To give you a better idea of what our MA students study, we’re including specific course names within this section. These may seem daunting to some, but our instructors provide support and often go above and beyond for their students. It’s also good to remember that you can tackle anything if you set your mind to it! The primary goal of our program is to prepare graduates for entry-level employment as Medical Assistants. Successful graduates will be able to perform various administrative functions in the field. These include duties like answering phone calls, scheduling appointments, greeting patients, maintaining patient charts, replenishing supplies, handling bookkeeping tasks, and arranging for hospital admission as well as laboratory services. Additionally, graduates will be ready to perform clinical duties. For instance, they can call in prescriptions to a pharmacy, collect laboratory specimens, disinfect medical instruments, prep patients for x-rays, take electrocardiograms, remove sutures, and much more. Without a doubt, Medical Assistants fill several roles in healthcare. Not only is Unitek’s Medical Assisting program a great step in your career path, but it can also provide you with rich experiences and various networking opportunities. Follow your dreams with Unitek College! For more information about the MA program and our Fremont Campus, please contact us toll free at 888-775-1514.